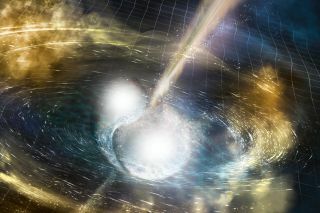 An illustration of two merging neutron stars. The photons shoot into space in an energetic rush. Hot beams of X-ray energy burst from the surface of the tiny, ultradense, spinning remnant of a supernova. The beams disperse over long centuries in transit. But every once in a while, a single dot of X-ray light that's traveled 156 parsecs (512 light-years) across space — 32 million times the distance between Earth and the sun — expends itself against the International Space Station's (ISS) X-ray telescope, nicknamed NICER. Then, down on Earth, a text file enters a new point of data: the photon's energy and its arrival time, measured with microsecond accuracy. That data point, along with countless others like it collected over the course of months, will answer a basic question as soon as summer 2018: Just how wide is J0437-4715, Earth's nearest neutron-star neighbor? On Earth, given humanity's existing technology, there are some hard limits on how dense matter can get, even in extreme laboratories, and even harder limits on how long the densest matter scientists make can survive. That's meant that physicists haven't been able to figure out how particles behave at extreme densities. There just aren't many good experiments available. "There's a number of different methodologies that people come up with to try to say how super-dense matter should behave, but they don't all agree," Morsink, a physicist at the University of Alberta and a member of a NASA working group focused on the width of neutron stars, told Live Science. "And the way that they don't all agree can actually be tested because each one of them makes a prediction for how large a neutron star can be." In other words, the solution to the mystery of ultradense matter is locked away inside some of the universe's densest objects — neutron stars. And scientists can crack that mystery as soon as they measure precisely just how wide (and, therefore, dense) neutron stars really are. "Neutron stars are the most outrageous objects that most people have never heard of," NASA scientist Zaven Arzoumanian told physicists at the meeting in Columbus, Ohio. Arzoumanian is one of the heads of NASA's Neutron Star Interior Composition Explorer (NICER) project, which forms the technical basis for Morsink's work. NICER is a large, swiveling telescope mounted on the ISS; it monitors and precisely times the X-rays that arrive in the area of low Earth orbit from deep space. A neutron star is the core left behind after a massive supernova explosion, but it's believed to be not much wider than a midsize city. Neutron stars can spin at high fractions of the speed of light, firing flickering beams of X-ray energy into space with more precise timing than the ticking of atomic clocks. And most importantly for Morsink and her colleagues' purposes, neutron stars are the densest known objects in the universe that haven't collapsed into black holes — but unlike with black holes, it's possible for scientists to figure out what goes on inside them. Astronomers just need to know precisely how wide neutron stars really are, and NICER is the instrument that should finally answer that question. Scientists don't know exactly how matter behaves in the extreme core of a neutron star, but they understand enough to know that it's very weird. Scientists have some excellent measurements of the masses of neutrons stars. The mass of J0437-4715, for example, is about 1.44 times that of the sun, despite being more or less the size of Lower Manhattan. That means, Morsink said, that J0437-4715 is far denser than the nucleus of an atom — by far the densest object that scientists encounter on Earth, where the vast majority of an atom's matter gathers in just a tiny speck in its center. Most neutron stars, Morsink said, are believed to be between about 12 and 16 miles (20 and 28 kilometers) wide, though they might be as narrow as 10 miles (16 km). That's a very narrow range in astronomy terms but not quite precise enough to answer the kinds of questions Morsink and her colleagues are interested in. To press toward even more precise answers, Morsink and her colleagues study X-rays coming from rapidly spinning "hotspots" on neutron stars. That's where NICER comes in. NICER is a large, swiveling telescope mounted on the ISS that can time the light coming from those patches with incredible regularity. 1. The speed of rotation: When the neutron star spins, Morsink said, the bright spot on its surface winks toward and away from Earth almost like the beam from a lighthouse turning circles. Morsink and her colleagues can carefully study NICER data to determine both exactly how many times the star is winking each moment and exactly how fast the bright spot is moving through space. And the speed of the bright spot's motion is a function of the star's rate of rotation and its radius. If researchers can figure out the rotation and speed, the radius is relatively easy to determine. 2. Light bending: Neutron stars are so dense that NICER can detect photons from the star's bright spot that fired into space while the spot was pointed away from Earth. A neutron star's gravity well can bend light so sharply that its photons turn toward and smack into NICER's sensor. The rate of light curvature is also a function of the star's radius and its mass. So, by carefully studying how much a star with a known mass curves light, Morsink and her colleagues can figure out the star's radius. Morsink told Live Science that she wasn't trying to tease the upcoming announcement. NICER just hasn't collected enough photons yet for the team to offer up a good answer. "It's like taking a cake out of the oven too early: You just end up with a mess," she said. But the photons are arriving, one by one, during NICER's months of periodic study. And an answer is getting close. Right now, the team is looking at data from J0437-4715 and Earth's next-nearest neutron star, which is about twice as far away. Morsink said she isn't sure which neutron star's radius she and her colleagues will publish first, but she added that both announcements will be coming within months. "The aim is for this to happen later on this summer, where 'summer' is being used in a fairly broad sense," she said. "But I would say that by September, we ought to have something."